Strike up some fun on Xtreme Action Park’s bowling lanes! Located just inside the main entrance, Xtreme bowling consists of 6 full size lanes where you can enjoy plush seating and personal lane service . Featuring the latest technology, each lane has designated projection screens, LED lighting and touch screen monitors. Hourly rentals available on nights and weekends. Please Note: Our lanes have a string pinsetter that provides the real experience of bowling. We use the same Brunswick pins as regular pinsetters, offering great pin action and scores. Most recreational bowlers will enjoy the game of bowling, just as they would with a traditional pinsetter. While lanes are regulation length and size, we are not sanctioned by the PBA. Just have fun! 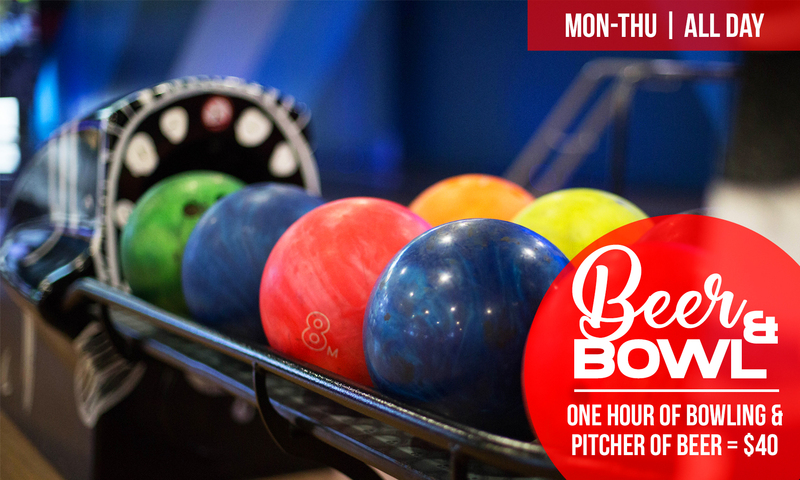 One Xtreme Ale Beer Pitcher plus One Hour Bowling with Shoe Rental for up to 6 guests. Upgrade to Craft Beer for $5 more. Subject to availability. Must be 21 or older to drink. Fountain Soda can be substituted for Beer.